Nob War: the Elves is an epic strategy war game from Nob Studio. Your goal is to build an army of elves, humans and centaurs and kill all enemies on your march to the castle without losing all of your elves or flag guards. Use the left and right arrows to move your elves army, press Z to shoot arrows, V to summon Humans (good defense) and B to summon Centaurs. The green line shows where your arrows will hit. For each enemy killed, you get money, which can be spent in the castle on upgrades. 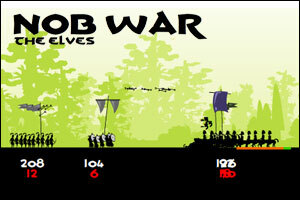 Nob War: the Elves is a simple and challenging game, very addictive and very well done. Posted on Friday, April 9th, 2010. Follow any responses through the RSS 2.0 feed.